PT Bank BNI Syariah - BNI Syariah is a well-established sharia banking company headquartered in Jakarta. BNI Syariah is a member of state-owned lender PT Bank Negara Indonesia (Persero) Tbk (BNI Group). As today, PT Bank BNI Syariah is 99.99% owned by PT Bank Negara Indonesia (Persero) Tbk, and 0.1% by PT BNI Life Insurance, a reputable insurance company in Indonesia which majority owned by BNI Group. BNI Syariah has its business activities focused in four business pillars, comprise of commercial business, consumer and retail business, micro business, treasury and international business. As of December 2016, BNI Syariah offer services through 326 outlets spread in all over Indonesia and served by 4,450 employees. According to PT Bank BNI Syariah in its Annual Report 2016 as cited by JobsCDC.com, Bank BNI Syariah generally recorded a good performance in 2016. 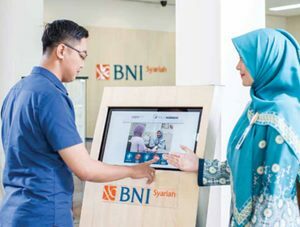 BNI Syariah managed to increase its total income by 32.7%, from Rp 229 billion in 2015 to Rp 277 billion in 2016. Referring to its annual report, BNI Syariah maintains total asset of Rp 28,314 billion at the end of 2016. This number reflected an 23.01% increase from Rp 23,018 billion in 2015. Male or Female, good looking. Height 165 cm (Male) and 160 cm (Female) with proportional weight. Hold Associate Degree (D3) in any field, except Health major. Minimum GPA of 2.75 for PTN and 3.00 for PTS. Good looking, friendly and have a good health. Strong motivation, high integrity, hard workers and thorough. 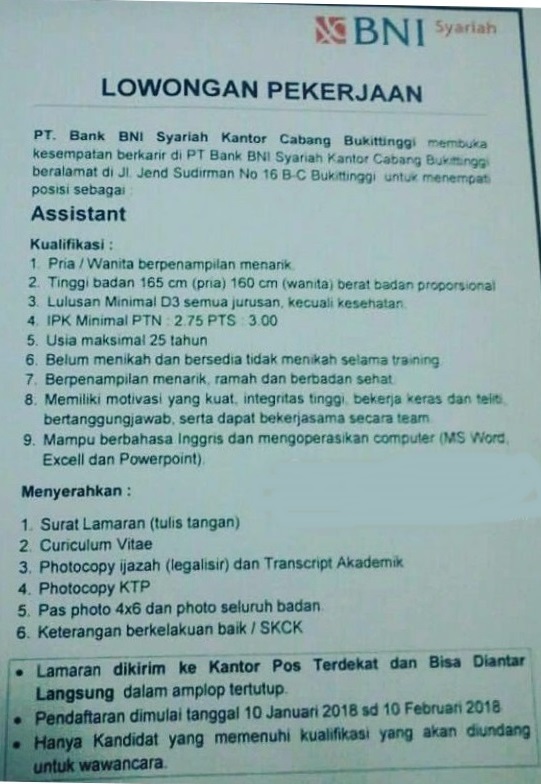 Fluent in English and computer literate (MS Word, Excel and Power Point). JobsCDC.com now available on android device. Download now on Google Play here. Please be aware of recruitment fraud. The entire stage of this selection process is free of charge. PT Bank BNI Syariah - D3 Fresh Graduate Assistant Program BNI Syariah January 2018 will never ask for fees or upfront payments for any purposes during the recruitment process such as transportation and accommodation.